http://sonicartresearch.com/ . 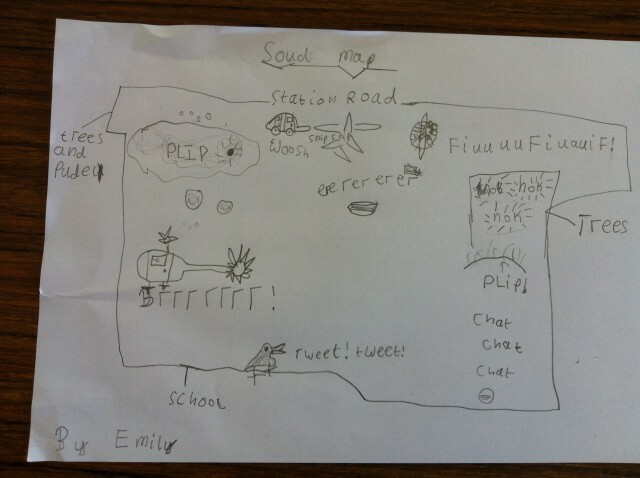 We devised three sessions where the pupils could interact and experience sound. One session involved the creating of domestic sounds, particularly kitchen sounds, listening to them with ears and mics. 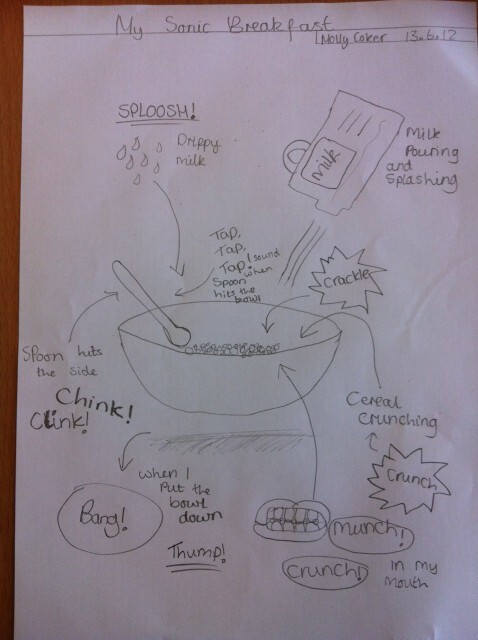 Felicity Ford encouraged the pupils to think of their own noisy foods, so bowls of cereal were no problem. http://www.thedomesticsoundscape.com/ She invited them to listen in to the squeaky cabbage as they cut it, and the bubbling pot of potatoes cooking on the hob in the school kitchen that they had just peeled. 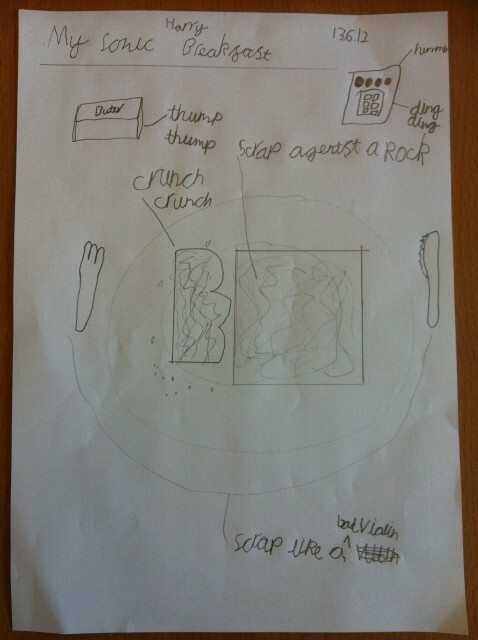 They drew great pictures of the breakfasts they had eaten in the morning, describing the sounds they heard. Like wise crisps and even a cabbage and crisp sandwich! The third session explored the way different sound waves travel. I took the equipment I have been using for various sound works and we tried them out. 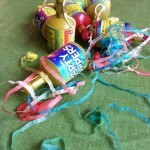 •	Setting off party poppers at different distances down the school field, we listened to the way sound behaved travelling through air. •	The pupils also experimented with various implements like glasses, stethoscopes, tubes and funnels to listen to sound through a wall. On the other side of the wall some recoded sound was being played. 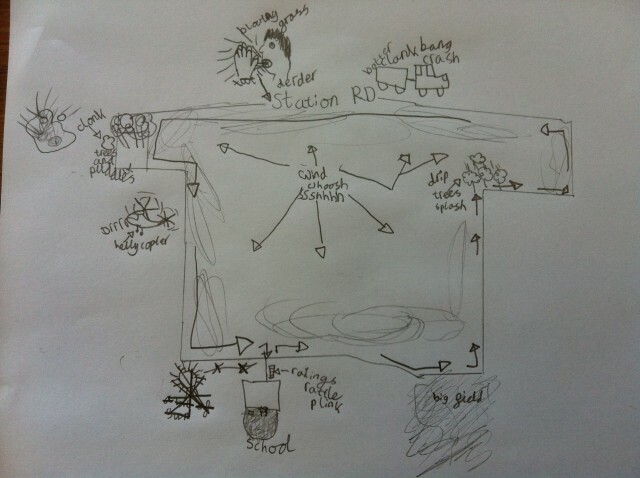 •	A hydrophone was set up in the sink and pupils tried listening to the sounds in the water through headphones, by turning on the taps and swishing the water around and anything else they thought to try. •	The geophone was set up so it played live sound into the subwoofer in my car. This meant pupils could experiment by tapping or stamping on the ground and hearing the sound picked up by the geophone (mic) in the ground. 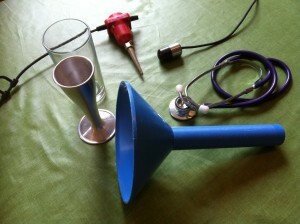 The picture above shows a red geophone, a black hydrophone, a purple stethoscope and funnels and glasses for listening through walls. I was pleased to enable the classes to have a hands-on experience and facilitate their creative input to the type of sound ‘uncovering’ I have been thinking about and developing as practical research for my PhD. The staff working with the classes commented how absorbed the groups were in searching out new experiences. 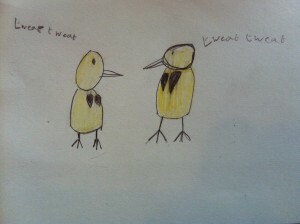 The pupils used both the high and low-tech tools with ease. I thought it would take a bit of time to listen in and focus on the sounds and ideas we put forward, but the sensitivities to sounds were acute and the drawings and questions were imaginative and searching.